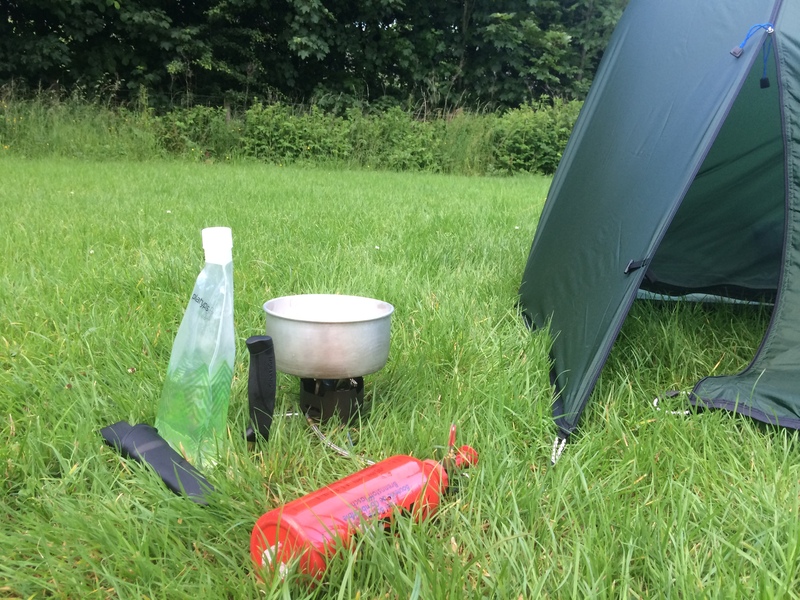 Dave looks at the iconic multi fuel stove and asks – is it needed in the 21st Century? For over 35 years, the MSR® XGK™ stove has been the world’s most reliable extreme-condition stove; trusted by mountaineers everywhere. With the advent of good quality winter gas one the questions I get asked is why bother with the messy and tiresome business of liquid fuel stoves at all. Well if you’re into gourmet cooking and require a fine tuned flame to flambé your crêpes whilst on expedition then a gas powered stove is the ideal solution, but if you want a rocket propelled, super powered snow melting machine then you’re going to need something more. Add to that the problems of sourcing gas in more remote parts of the planet and you’re left in no doubt that using a liquid fuel stove hasn’t been made redundant. 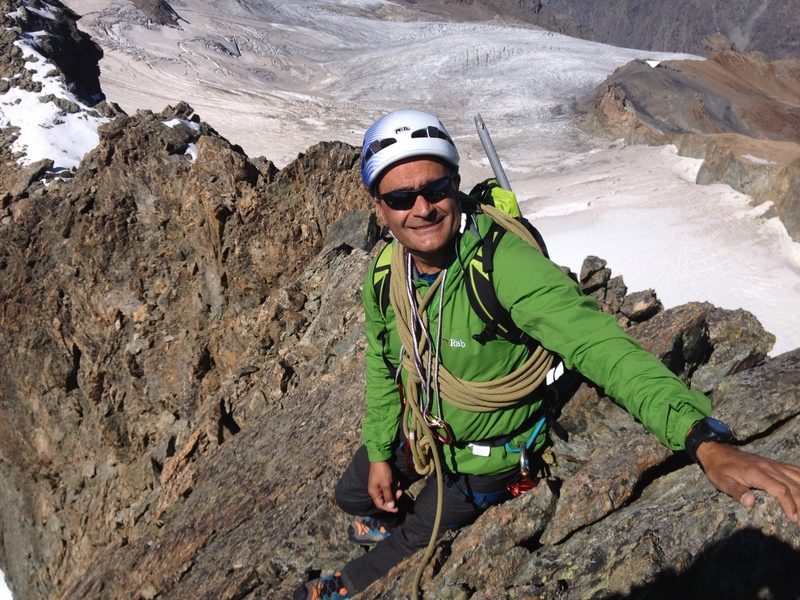 The MSR XGK-EX has been part of the MSR stove range for over 35 years and has been part of just about every expedition going and has been proved throughout the planet. As I’ve said before I often just need to boil water on expedition, these days I’m very much a #microadventure mountaineer when I’m now working expeditons. I go on short, intensive trips with no specific objectives, just a vague plan and the ability to be opportunistic. 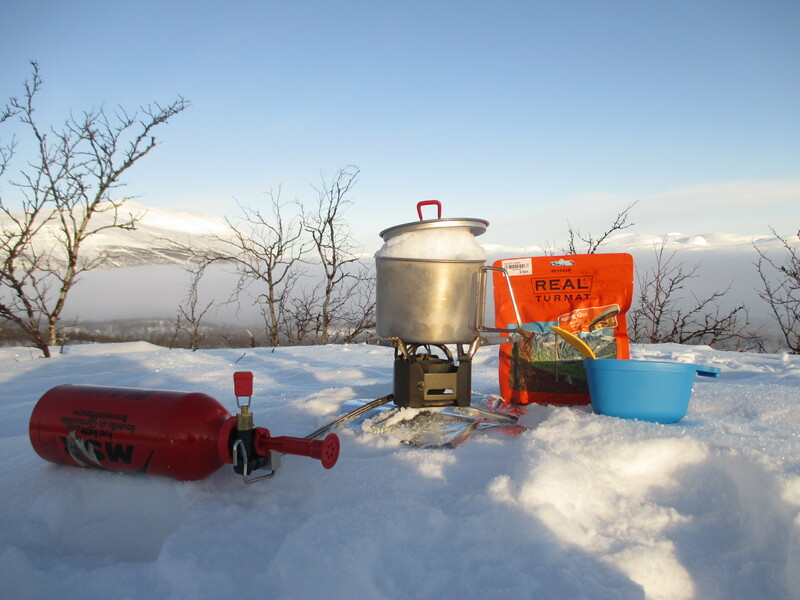 I therefore rely on freeze dried food for my main meals, I have found the quality has improved over the years and manufacturers such as The Real Turmat make some of my favourite camp meals. So I need a water boiler, plain and simple. If it can melt snow fast, all the better. The MSR XGK-EX is a snow melty machine par excellence! So I need flexibility with the stove system I take with me. So in March on a cross country/snow shoe trip to Northern Sweden the MSR XGK-EX was the obvious choice, plentiful fuel and average temperatures of -10°C always meant gas was going to be a problem. Even if you are passing a hut, they are often powered by petrol generators and if you ask the warden nicely they will sell you a little fuel. Petrol can be bought just about everywhere on the planet and if that isn’t available the diesel or even aviation fuel can be so the XGK-EX is very versatile but I always offer the following proviso on my expedition courses – fuels have very different qualities throughout the world. If you’re using the stove in North America or Europe (or any other First World country) then it won’t need cleaning as much as if you using it in the Middle East, Asia or Africa where fuels have much more additives in them. 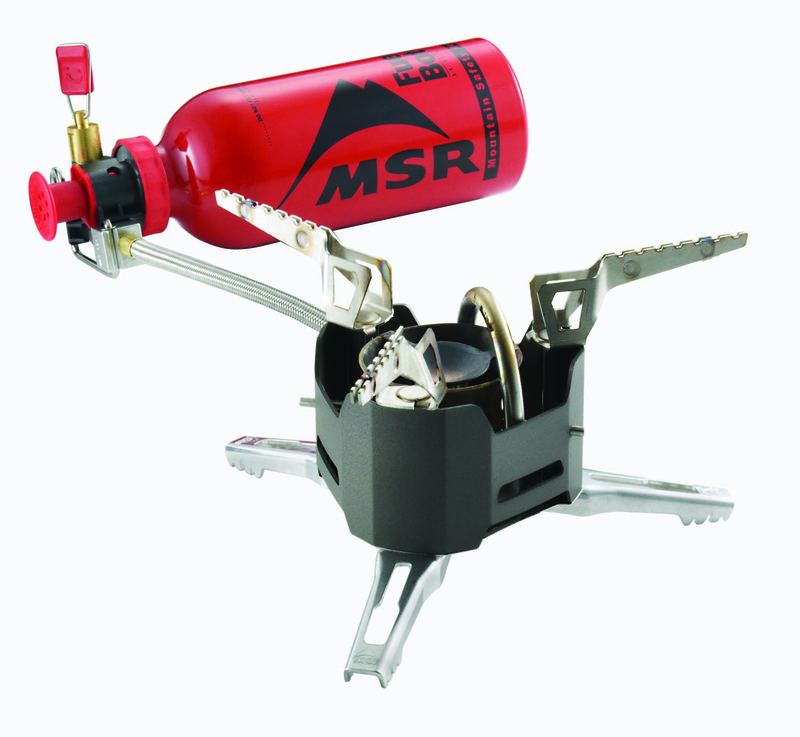 The MSR XGK-EX does come with a small field servicing kit and is easy to clean (more on this later). The stove is very compact and comes with a pump unit but you will need to purchase a fuel bottle. The stove and pump weight came to 388g so just a little over the stated minimum weight so it’s not the lightest system out there. It is, however, very compact and the super flexible hose means you can tuck it underneath the pot supports to make it one of the most compact looking multi fuel stoves I have ever used. The ingenious folding supports and legs are connected together, so as you pull the pot stand out so the leg comes out with it. This makes for a very robust stove, and the whole unit feels bombproof, unlike the Dragonfly I have used before which always felt a little flimsy. If you have never used a multi fuel stove system before they do take a little care with setting up and lighting. Fortunately, technology has moved on and you don’t have to prime it with paste but you still have to be very careful when lighting the stove. They can spit a little fuel out when the first release gas and I have found that once you have pumped the system up, open up the valve and let a little of the fuel come out then close it again. Let that fuel evaporate and then open the valve again and hopefully gas will come out. In any event you don’t want to be lighting one of these stoves inside your expensive tent, I have witnessed first hand the explosive nature of this type of stove when it gets covered in fuel. That said, the benefits outweigh those risks and once the stove is roaring away you will definietely wake everybody up on the campsite as they think you have just started up a jet engine. Nothing sounds as good as your rocket powered water boiler, safe in the knowledge that you’ll be melting a glacier worth of snow into coffee in no time at all. I’m not going to go into boil times as they should always be taken with a pinch of salt. Conditions change and the likely hood of you achieving the optimum lab conditions to get anywhere near the official boil times is remote at best. I can say, however, that the MSR XGK-EX will melt a litre of snow way, way faster than any gas stove. On any expedition you will need to keep your stove in top condition to make sure it doesn’t let you down just when you need it most. I usually use my stove with unleaded petrol, it’s cheap and readily available; it’s also quite a dirty fuel and so clogs up the jet. Usually this isn’t a problem, the stove still works and the Shaker Jet technology cleaning does work as long as you do it regularly; as in before each use. Eventually it will need to be taken apart and cleaned thoroughly. The XGK-EX comes with a small parts kit, but I have bought the Annual Maintenance kit and with some of the expeditions I have planned for the next year or so I will probably buy the more comprehensive Expedition Maintenance kit. The kit also comes with a windshield as the stove’s performance drops when exposed to high winds. Even on short trips the XGK-EX is a great basecamp stove – as long as you don’t mind waking up the neighbours with a jet engine! Onto the pump, this is by far the weak part of the system (that’s why you can buy spare ones!). In order to keep the weight down MSR have decided to make the fuel pump from plastic. A quick search of forums will show that people have broken them in use. I have used MSR stoves for many years and have never broken one and feel that as long as you are careful with the pump it should be OK. If you are planning a very remote and long expedition I would definitely want to take a spare as if the pump shaft breaks you are pretty scuppered. The pump does provide great pressure in the system and a quick turn of the valve will release gas. You should note that there is no flame control on the XGK-EX (if you want that I have used the MSR Dragonfly in past and found it great if flame control is something you feel you need) you either have full jet propulsion complete with glowing red metalwork or off. If I was going on a remote expedition for a decent period of time I would definitely take a spare pump – to be honest the pump is so important on any system that I would take a spare if it was made from metal. You also need to remember that metal has a tendency to perform poorly in very cold conditions, but then a again plastic becomes very brittle too – so as always it’s a question of compromise. MSR provides some great information on their website about the reasons why the liquid fuel stove isn’t ready to die out yet and I agree – if you a serious expedition geek the a multi fuel stove is a must have in your gear shed (what do you mean you don’t have a gear shed!!) and the MSR XGK-EX is one of the very best out there. Of course, you’re waiting for the answer to my original question – is a liquid fuel stove still relevant in the age of the Windburner type stove? Yes it is – there are still vast swathes of the planet where there is no way you would get gas canisters and because you can’t take them on a flight that’s too big a risk so the MSR XGK-EX definitely has its place for the 21st Century Global expedition freak! Available from various outlets and from our partner Facewest.